TeleCenter provides you with every feature of a first class PBX Phone System without any additional hardware, phone lines or software. In fact, it even uses your existing phones and Internet connection! Plus TeleCenter is ready to go in minutes, not the weeks or months that it typically takes to purchase and install a phone system! 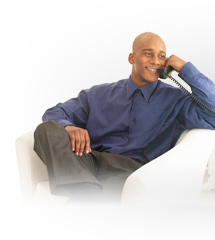 TeleCenter is Virtual PBX, Presentation Hotline, Voicemail, Answering Service, Auto-Attendant and a Fax Line all in one. TeleCenter is revolutionizing the way small businesses, home businesses and entrepreneurs run their business. TeleCenter gives any business the power to communicate professionally and productively. TeleCenter provides all the functionality of a high-end telephone system without the expensive up-front costs and endless management and maintenance headaches. Portray a Professional Image – With a Toll Free number your customers will perceive your business as being more solid, well established and successful even if you’re working from home. TeleCenter’s auto-attendant system adds to that image of a substantial business by guiding callers to the appropriate department or extension or by providing automated information about your products or services that is accessible 24/7. Never Change Your Phone Number Again – Your Toll Free TeleCenter number will never change! Even when you are ready to expand and need to move into that new Office building, TeleCenter will move with you in minutes. It does not matter if you are moving across the street, town or country. Only One Number to Remember & Provide – Think about it! A business card with just one number that can reach you anywhere, anytime and only when you want to take the calls; it's that simple. Organize Employees and Departments – Have one centralized telephone number regardless of where your employees are located. Unify physically remote workers into a single toll-free number. Assign separate extensions to each employee; calls will forward to wherever they are! Each employee's personal extension comes with the same host of customizable features as your main number, including voicemail, message notification, on-hold music and comprehensive call forwarding options. Protect Your Privacy – TeleCenter protects your home, office, cellular and other personal contact information. The only number you will ever have to give to your contacts is your Toll Free TeleCenter number and it comes equipped with numerous call blocking features to help you manage your calls and deter harassing callers. Save Time By Talking to the Callers You Want to Talk To – TeleCenter can announce the caller's name and/or phone number giving you the choice to take the call or send the caller to voicemail. Our Caller ID captures the phone number even if the caller blocked his or her number. You’ll save huge amounts of time by sending “time wasters” to voicemail. Never Miss an Important Phone Call Again – When you or your employees receive a call, your TeleCenter contacts you at the various numbers you have programmed into your system and announces the caller’s name giving you the choice to take the call or send the caller to voicemail. TeleCenter eliminates the need for your clients to make unnecessary calls to multiple numbers, and allows you to take your important calls no matter where you are. Being available to your clients is better customer service and can literally mean the difference between getting or losing a sale. All of Your Communication in One Spot – TeleCenter brings together all of your communication – e-mail, voice and faxes – in one place. And you can check all of your messages online, via e-mail, or from any phone. How much time do you spend every day checking multiple voicemail and e-mail accounts? Instant Notification of New Messages – TeleCenter can alert you via e-mail, text message, pager or telephone whenever you receive a new message so you can get back to your important prospects and clients right away. •	Question & Answer Ext.